Top contributor Enrico Pescantini created this amazing drone video of a magnificent hermitage built into the side of a mountain in the province of Verona in northern Italy. 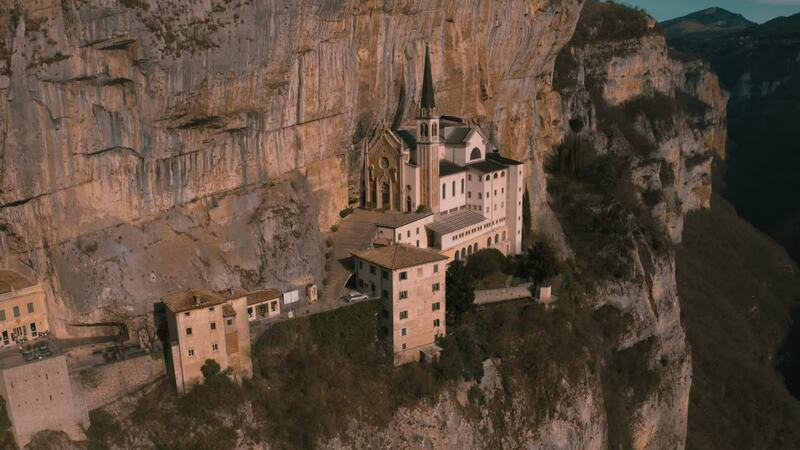 The Santuario Madonna della Corona was a hermitage appears to have been built into a sheer cliff face in the Monte Baldo range, which sits across the Trentino and Verona provinces. Constructed in the 16th century, the structure was virtually inaccessible due to the treacherous access path which has been recently modernized. Description: Aerial view by drone of beautiful hermitage Santuario Madonna della Corona, located near Verona, Lake of Garda, Italy. Shot with drone DJI Mavic 2 Pro. Catholics hermits have been praying in this very spot for over a thousands years, a place of silence and meditation between the sky and the earth, accessible only by a steep and dangerous pathway carved into the mountain. Hermitage Madonna della Corona is a sacred place hidden in the Italian alps, and truly inspires admiration and contemplation just visiting it.